“Global health education is at a crossroad. The landmark Commission on Education of Health Professionals for the 21st Century highlighted the substantial disparities in health education worldwide and proposed reforms to enable all health professionals to “participate in patient and population-centered health systems as members of locally responsive and globally connected teams”. This quote was taken from the Lancet article entitled ‘Equitable access for global health internships: insights and strategies at WHO headquarters.’ The Lancet Global Health article highlights the need for broadly accessible global health internships— ones that allow for exposure to community-engaged programs by students from a variety of socioeconomic and professional school backgrounds. The barriers to access to global health educational opportunities are real and require the global health education community to embrace novel approaches, alliances, and funding mechanisms. 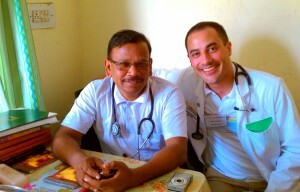 CFHI global health interns with local physician in Ecuador. Child Family Health International– CFHI a leader in global health education programs for over 20 years, is mindful of these barriers. As a nonprofit running global health internships that advocate for ethics and social responsibility, we recognize there are significant costs associated with global health internships and provide fair compensation to local communities and professional mentors that shape the intern experience through their time, energy and expertise. This follows best practice guidelines set out by the Working Group on Ethics Guidelines for Global Health Training (WEIGHT). However, program fees needed to provide resources for host communities and to support and educate interns can be a barrier to equitable access to reach beyond students from resource-rich backgrounds. Like the WHO, CFHI utilizes scholarships in an effort to seek out candidates that may have greater financial need, limited opportunity to travel abroad, and those whose are under-represented in our programs. Scholarships and funding initiatives such as these are key to making real strides in south-to-south participation in global health internships and reducing their exclusivity as the domain of the wealthy. In addition, CFHI provides a crowdfunding platform to make it easier for students to raise funds through friends, family, mentors, and wider social media networks. Crowdfunding is growing, and is a powerful tool that should be considered by WHO and other global health internship providers. The article is ‘right on’ with its call to arms. If global health education programs and internships to not focus on equity, access and diversity, we risk perpetuating the same power imbalances and disparities that the global health community strives to eliminate. Child Family Health International commends WHO and the Lancet article authors for highlighting this issue and remedying it with action and advocacy. How can we ensure that more students have access to global health and other professional and international internships? Comment on the Lancet blog or tell CFHI what you think below! This entry was posted in CFHI Model, Global Health Education, Public Health and tagged Ashton Barnett-Vanes, cfhi, child family health international, crowdfunding for global health, equitable access, fair compensation local communities, Global Health Education, global health internships, health equity, Lancet Global Health, Local Experts, scholarships for global health, the lancet, underrepresented students, WHO, Working Group on Ethics Guidelines for Global Health Training on July 1, 2014 by Jessica Evert, MD. Child Family Health International (CFHI) at 20 years old continues to be the gold-standard in forward thinking and innovative frameworks in global health education. CFHI provides community-based education alongside local professionals via clinical and public health experiences for students and those interested in learning more about medicine and health-related fields, with more than 20 programs in 6 countries. Programs cover a variety of topics from maternal health to palliative care. After all these years CFHI remains unique, continuing to challenge paradigms in global health and advocating for local communities. CFHI partners with communities that are considered low-resource and underserved by global financial standards. Rather than focusing on what is lacking, however, CFHI helps to identify community strengths, ingenuity, and passion. In close collaboration with local teams, CFHI creates programs and funds community health projects identified and carried out by local teams. This practice is based on the asset-based community development approach, formalized at Northwestern University. The CFHI approach positions local health practitioners and patients as the ‘local experts’—presenting global health realities through authentic experiences that help shape and transform young people who are interested in global health, equity, and global citizenship. Importantly, CFHI is a staunch proponent of compensation for local community contributions and practicing financial justice. Uniquely CFHI, 50% or more of student program fees go directly to the communities they will be visiting, benefiting the local economy at large and specifically undeserved health systems. CFHI is an active affiliate of Consortium of Universities for Global Health, United Nations ECOSOC and has authored literature about global health educational curriculum development at undergraduate and graduate levels. CFHI encourages students to “Let the World Change You” in preparation for being a part of socially responsible, sustainable change they wish to see in the world. This entry was posted in CFHI Model, Ethics, Global Health, Global Health Education, Local Experts, Volunteering internationally and tagged ABCD, Asset Based Community Development, authentic experiences, cfhi, child family health international, community based education, community contributions, community development approach, community strengths, CUGH, curriculum development, ecosoc, educational curriculum, global citizenship, Global Health, global health internships, health abroad, health equity, health practitioners, health systems, Local Experts, maternal health, medical electives, Northwestern University on February 21, 2013 by Jessica Evert, MD.